This month’s poetic-prompt theme is “Rock and Roll, ” a theme I’m quite sure will inspire some good poems. This month, I tried to compile a playlist that was true to the roots of Rock and Roll, while still exploring some of its derivative sub-genres like Punk (for those who remember the 80s fondly) and Grunge (for those who remember the 90s fondly). I love the rhythms and the hard backbeats in the majority of this playlist. I’ve always thought a strong four-on-the-floor beat makes for a killer rock tune. What about you? What do you think defines Rock and Roll? Listen to this month’s musical collection here at Tweetspeak, and pen a poem or two about Rock and Roll. Write about the music, the feelings it evokes. Use Rock and Roll as a metaphor. Write about your first experiences with real Rock and Roll. Whatever you do, though, be creative and share it with us in the comments. Poetry Prompt: Plug in your headphones, listen to the Tweetspeak playlist, and write. What do the rhythms and lyrics conjure? What words come? Pen your Rock and Roll poem and share it with us in the comments below. Now who’s first? Come on. You might as well jump. This month we’re considering Rock and Roll and we’ll be composing poems around the theme. How do you participate? 1. Consider Rock and Roll. Think about your favorite band, song or album. Think about that awesome Van Halen concert you rocked out in the 80s, or listen to our monthly prompt-themed playlist. What images, emotions, metaphors, or allegories do they conjure? I love this, Maureen. Thanks for playing. And thanks to the rest of you who submitted this month. Do you want to have your work highlighted here at Tweetspeak? Join us this month as we explore the theme “Rock and Roll” maybe we’ll highlight your poem in the coming months. Photo by Berenice Decados, Creative Commons via Flickr. Post by Seth Haines. Buy a year of Every Day Poems, just $5.99 — Read a poem a day, become a better poet. In July we’re exploring the poetry theme Rock and Roll. Wow… I didn’t expect Even Flow to be filled with butterflies, and so of course this was all I could think of… Pearl Jam and Butterflies. Who knew? Certainly not me. You have expanded my thinking, Seth! Thank you! their songs telling stories, i could relate to. you can sing along-never had to wish you could. Rocking out with Van Halen in the 80s? Some of us think of the 80s as Post-Rock-No-Roll. Perhaps you meant Bill Haley instead of Van Halen? “Rock ‘n’ roll’s been going downhill ever since Buddy Holly died.”–from the movie “American Graffiti.” Truer words were never spoken. So surprised to be mentioned here this morning. 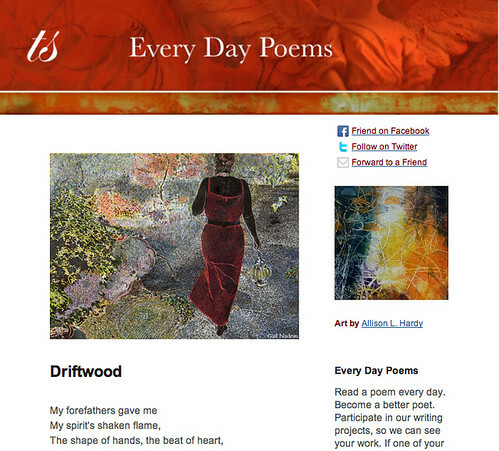 Thank you, Seth, for featuring my poem. Am looking forward to the rockers n’ rollers. On his 26 birthday Stevie Ray Vaughan’s wife Lenora (“Lenny”) gave him a used Stratocaster guitar he had admired in an Austin pawnshop. Later that night as she slept SRV wrote the song Lenny for her and played it when she woke. He named the guitar after her. in the red rising sky like it’s all I’ve got left. not for sweet love or even neat coffee. Elizabeth, I seemed to see several allusions in this, apart from the obvious ones. I loved the ending. I had some fun using only the titles of rock n’ roll hits. Love this! It reminds me of Book Spine Poetry, only with song titles. Really cool. This is very imaginative. I enjoyed it. Ooh, I like this! The ending is beautiful! Maureen, this is wonderful. You rock these poetry prompts and get my creative juices churning. Thanks for sharing your art so generously here. Thank you, everyone! I really appreciate your comments. I like the challenge of this, to use no words but the titles themselves and still get meaning. It’s not always easy. Remember “Hershey’s Got No Baby Ruth”? I also wrote a letter to Santa last December that incorporated Christmas song titles. It’s on my blog. this was a totally fun read. way to go! And in walked Robert Plant. Of a life with no love. So Rock-and-Roll. Let it carry you, back to where you come from.